Last night, House Judiciary Committee Chairman Jerry Nadler publicly informed soon to be former Acting Attorney General Matt Whitaker that he’d been nailed for perjury. This comes as no surprise to anyone who watched Whitaker’s testimony with a keen eye, or to anyone who reads Palmer Report. But now that the deed is done, what happens next? 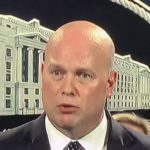 In short, Jerry Nadler, the House Democrats, and Robert Mueller now have Matt Whitaker by the you-know-what. Nadler says he has proof that Whitaker was lying when he claimed under oath that he never discussed the Mueller investigation with Donald Trump. Nadler just has to say the word, and Mueller can have Whitaker indicted and arrested for perjury. But that’s not the goal here. The goal is to scare Whitaker into coming back in for a new round of public hearings very soon, and make him admit in front of the cameras just what he and Donald Trump discussed about Mueller. This would not only give Mueller an easier path for nailing Trump on obstruction of justice, it would also allow the entire nation to see that Trump is in fact illegally trying to sabotage the investigation into himself. Matt Whitaker is ultimately going to prison no matter what he does next. In addition to the felony perjury, he’s also on the hook for his toilet scam company, which we know is already under FBI investigation. The best thing Whitaker can do for himself now is to immediately cut a cooperating plea deal with Mueller which includes telling the truth to the House Judiciary Committee. It’s his only shot at avoiding a rather long prison sentence.